Today, I used Facebook Chat to talk to friends, Venmo to pay my partner for lunch, and Vanguard to check on the status of my retirement accounts. There are 20+ apps on my phone, and while I don’t use all of them every day, they help me stay on top of my personal life. But when it comes to work, I’m not nearly as app-savvy. The number of apps I use on a daily basis is much lower, and I don’t think that’s a coincidence. Outside of the tech industry, many people (myself included) are “late adopters” with slightly dated views on how to do work. It’s hard for us to get used to things like Slack, for example, because we’re so stuck on traditional email threads. There’s something to be said for being as app-savvy in the workplace as we are in our personal lives. If we were, we could save tons of time and boost our productivity. 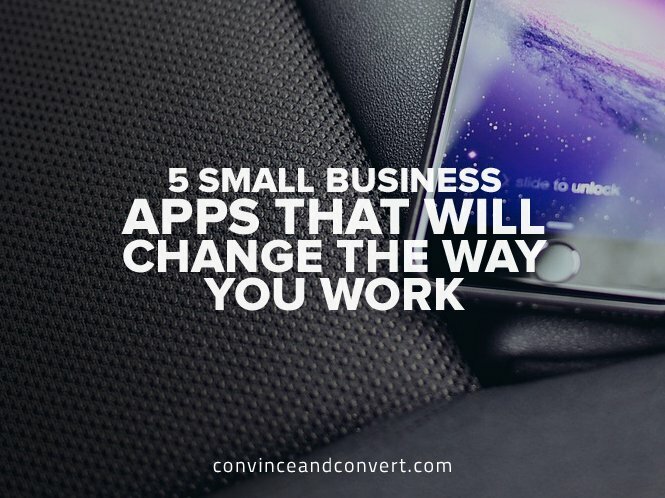 Here are five of the best small business apps that you probably aren’t using. There are plenty of payroll, benefits, and compliance solutions out there. There aren’t many that roll them all into one easy-to-use platform. Gusto manages to do just that. Its intuitive interface lets employees easily onboard themselves, so you can automate your payroll taxes, pick and choose workers’ comp insurance and health benefits, and keep track of 1099s, digital signatures, and all financial records—all from your smartphone. The best part? It integrates seamlessly with most accounting software, like Quickbooks. and spending way too much time on low-priority tasks. RescueTime helps you gain perspective, so you can spot inefficiencies in your workday, create personal and professional goals (like spending only one hour per day checking email), and set alarms that tell you when you’ve run over time on any given task. It even delivers detailed daily reports, weekly email summaries, and productivity scores to every team member. Gamification has lost a lot of its steam in the years since it first splashed into the business scene, but Habitica is an excellent example of gamification done right. It takes the monotony out of the daily grind by allowing users to incentivize their habits, dailies, and to-dos. By completing tasks, players can earn experience points and gold which they use to level up, buy gear for their avatar, and earn rewards. It’s perfect for teams and even schools because it motivates rather than monitors (like a timekeeping app). That being said, it probably isn’t for everyone, and will probably best fit people who already play games. Next on the list is Zip Schedules, a team-based project management app that helps managers both schedule and communicate with team members and better keep track of attendance. Zip Schedules allows employees and managers to communicate with one another to find replacements for last-minute shift swaps, sick days, or requests for time off. Managers can create schedules from their desktop, tablet, or mobile phone, and employees have the schedule in their back pocket. It’s tailor-made for restaurants, retailers, and more traditional stores where a manager won’t always be around their employees, but it’s just as useful for office teams that have to work together to tackle big projects with many moving parts. Then there’s Nimble, a different kind of social media-centric CRM. It’s the first sales and marketing CRM that works wherever you engage with your customers—including over social media channels like LinkedIn, Facebook, and Twitter. This is an upgrade to Salesforce’s much more basic email integration and allows account managers and sales teams to keep leads and customers top-of-mind at all times, opening up new opportunities for on-the-spot engagement. By doing away with data entry, keeping a log of all client interactions no matter where they happen, and automatically suggesting other key contacts based on your connections, Nimble is an account-based marketer’s dream come true. It’s no big secret that being productive at work will make you more successful and help you leave the office earlier. Yet, for some reason or another, we all make excuses and fall back into old, uninspired, nine-to-five habits. Here’s a challenge: Try out one of these five apps (or a different one, as long as it’s new to you), and see if it helps you finish work even just ten minutes faster than usual. Stick with it for a month, and see how much more time you save once you’re familiar with it. Then try another one. Being willing to adopt simple phone apps like these in your business life (just like you do in your personal life) will help you work harder, faster, and smarter. And they just might help you get out of work by 5:00 p.m.
Han-Gwon Lung is the award-winning CEO and proud co-founder of Tailored Ink, a boutique writing agency for businesses that want language that sells. He was the first hire at Prose Media and got his agency chops at places such as The Writer and The Economist. His writing has been published in Entrepreneur.